47 50-Rockefeller Center is the most northern stop before the 6 Avenue subway branches disjoin from each other, with the express tracks leading to the west on 53 Street (the B and D to Central Park) and the local tracks to the east on 53 Street (the V to that tunnel to Queens), and the two tracks that continue on 6 Avenue to 57 Street (the F, and the 63 Street tunnel) each joining the other two tracks via flying junctions that provide equally easy access to the express or the local. 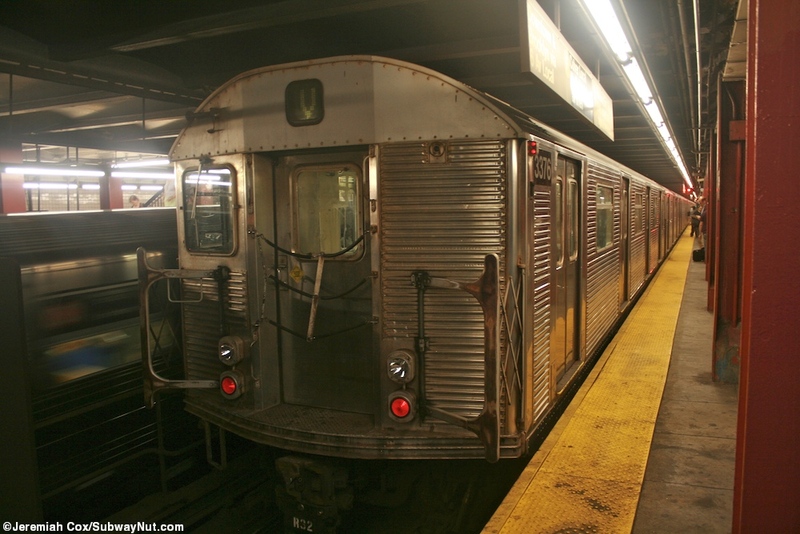 These requirements mean the stop has an unusual platform layout for its two island platforms for the four tracks. 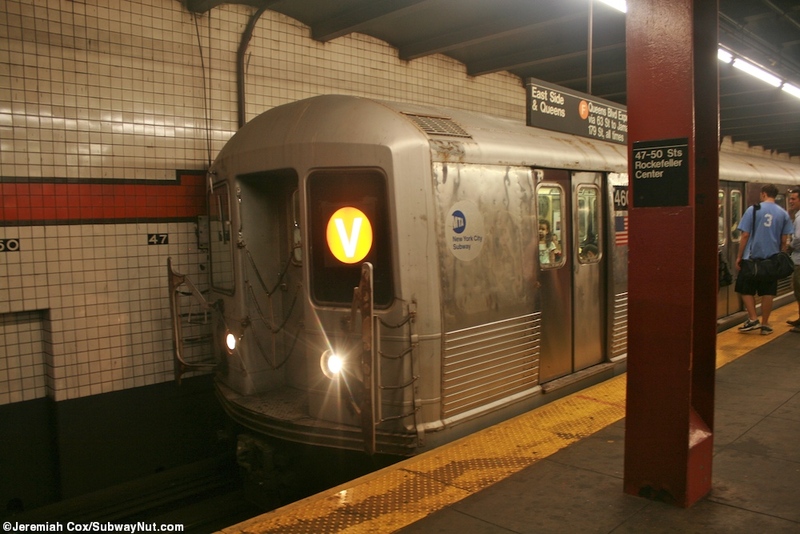 The uptown platform is typical, the F,V local on the outside and B,D on the inside track. 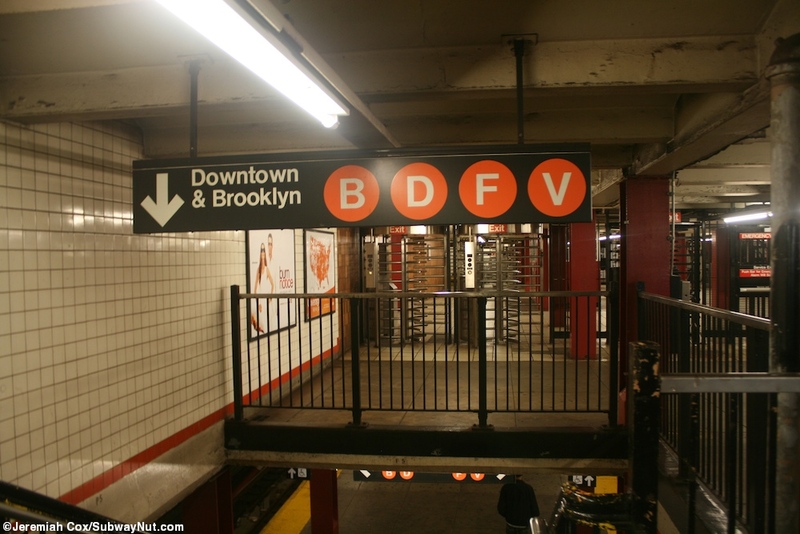 The downtown platform is flipped F,V tracks (to be closer to turn east on 53 Street) is the inside track and the B,D tracks are on the wall. 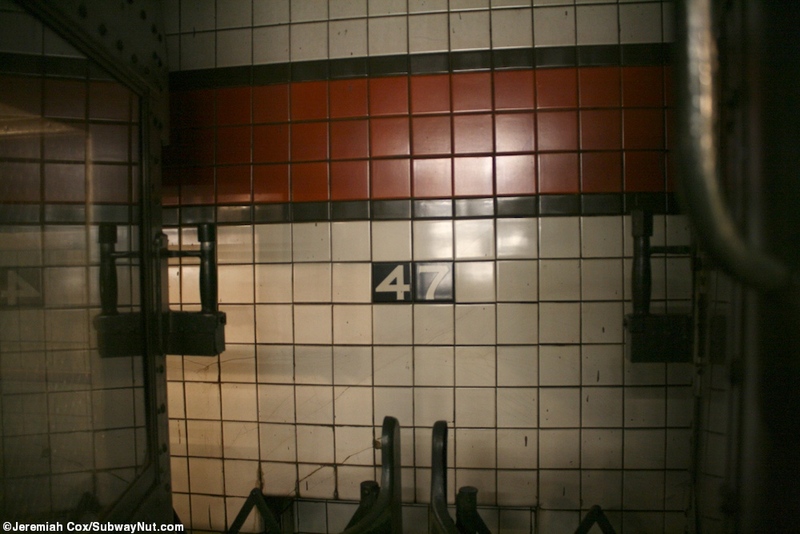 The platform walls of the station have an orange trimline with a narrow black boarder and little (and original) 47 and 50 tiles alternating along the walls. 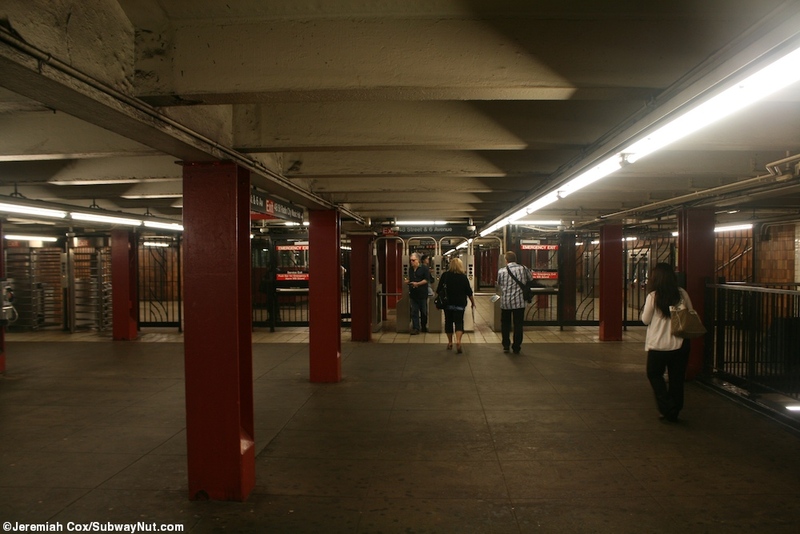 There is also a full-length mezzanine that is almost entirely within fare control but has a split area beneath 48 Street in its midsection. 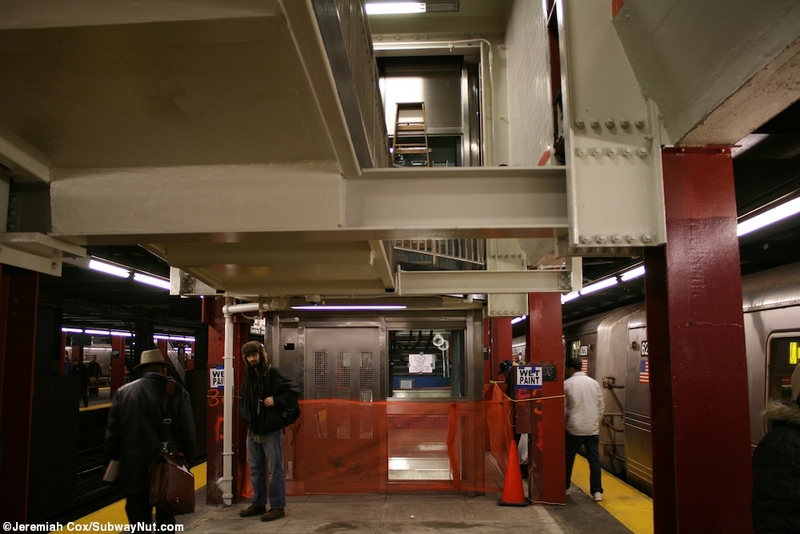 Staircases lead-up to it frequently and there are also platform elevators in the southern section of the mezzanine for ADA access. 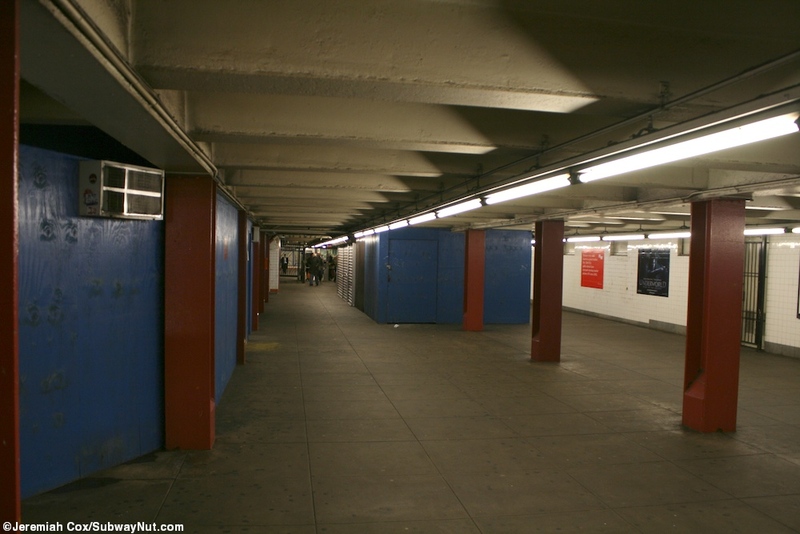 More importantly these portions of the mezzanine that belong to the station connect to the concourse of Rockefeller Center at all three of the fare control areas with shops, resturants, entrances, and in addition direct access to other major office buildings. 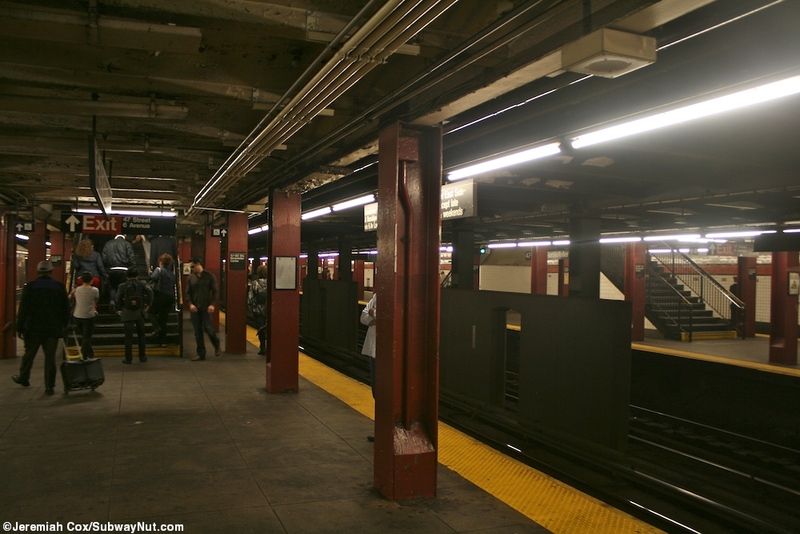 All three of the fare control areas are connected via a passageway to their west side and on the east side to Rockefeller Center, the platforms themselves only stretch from 47 to 49 Streets but the concourse extends north to 50 Street with those entrances directly labeled for the subway, although access requires walking through more than a city block of shops and restaurants. 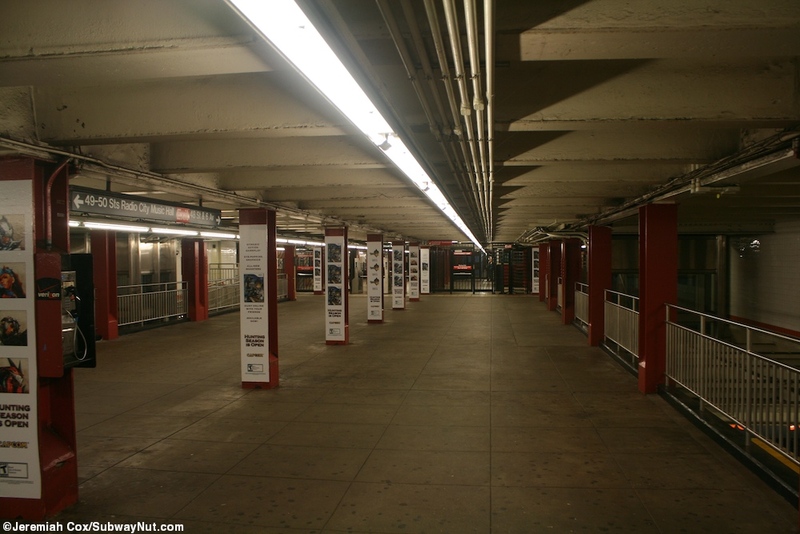 The first part of Rockefeller Center opened at the same time as the station so they were built together. 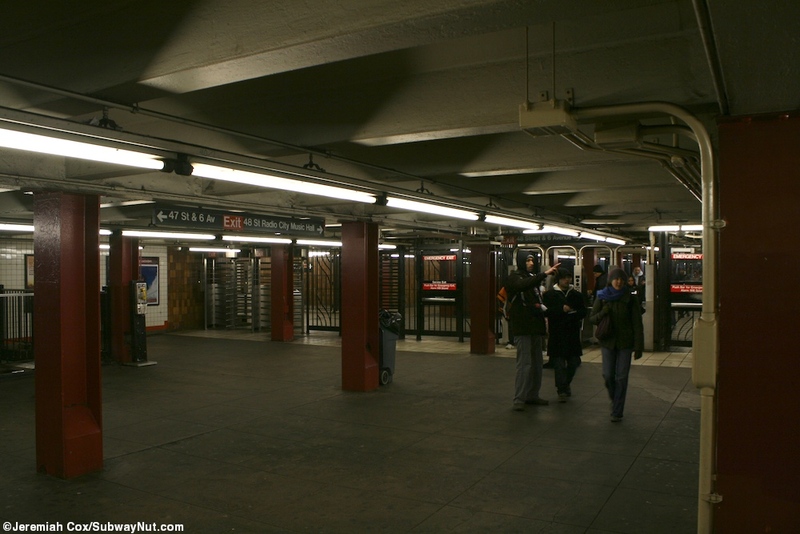 For entrances our tour will begin from the south beneath 47 Street and 6 Avenue, at the SE corner two conventional streetstairs lead to a newsstand at an intermediate underground level before becoming one to reach that end of the mezzanine, on the NE corner there is one conventional street stair, on the SW corner it also looks conventional but passes doors into 1185 Avenue of the Americas before reaching the Concourse. At the NW corner there is no exit just access to the concourse of the Celanese Building (1251), part of Rockefeller Center's 1960s expansion. There are no entrances though to the street in this area, just the building. 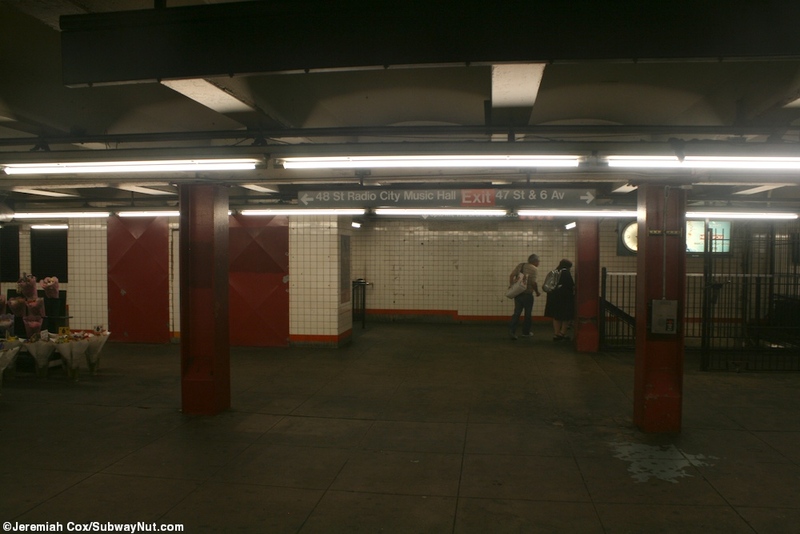 Next we come to the Central fare control area beneath 48 Street where there are two banks of turnstiles to the north and south portions of the fare control area, now unstaffed with the token booths removed. 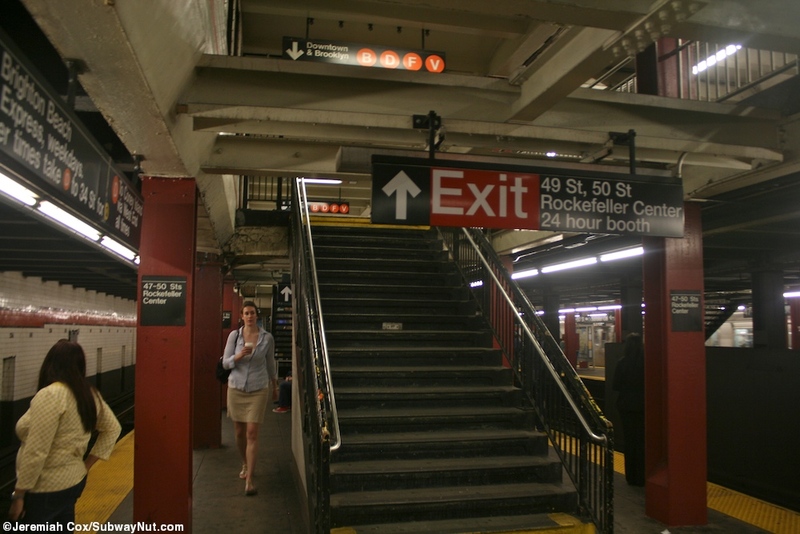 There are entrances via conventional streetstairs to the NE and SE corners, with just an entrance to the Rockefeller Center Concourse on the other other side. Here there is a staircase down to the concourse from the SW corner along the plaza outside the Celanese Building the concourse continues with doors out to suken plaza of the McGraw-Hill Building (1221 6 Av) where the only sign is for subway is after entering the plaza and not at the NW corner of 48 Street and SW of 49 Street staircases down to it. 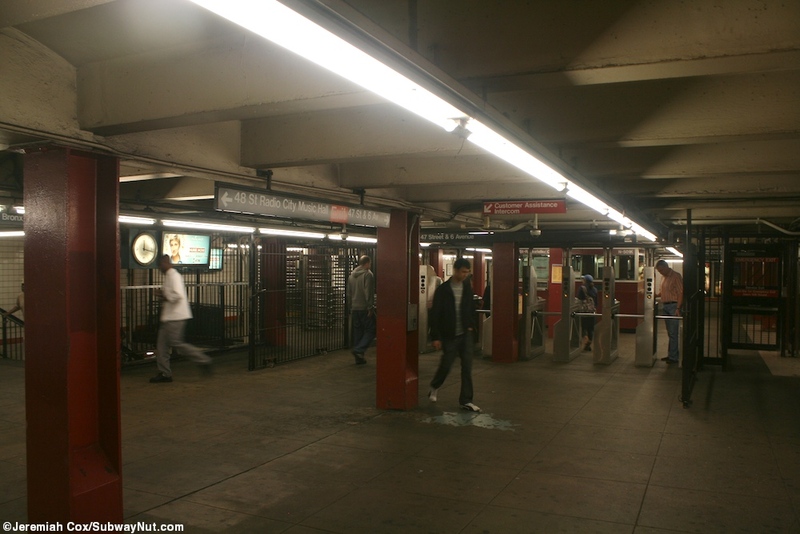 Continuing down the mezzanine we arrive at 49 Street where there is the 24-hour token booth and northern bank of turnstiles, with shops all around. 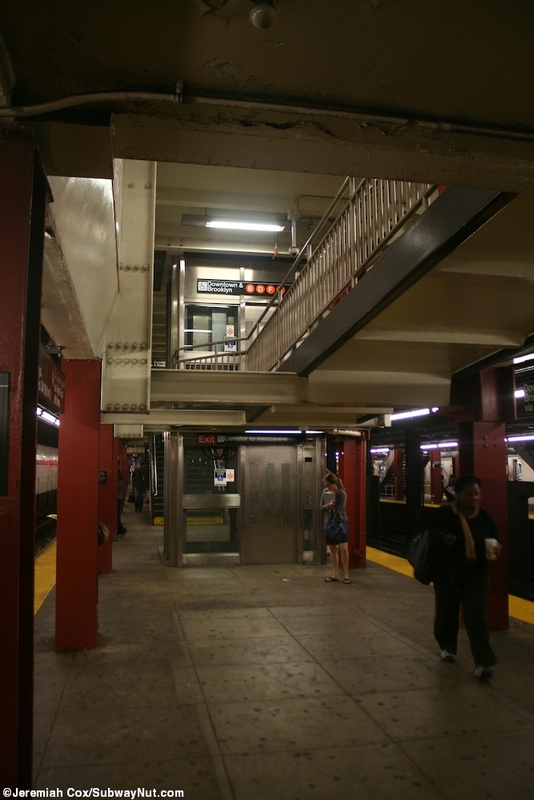 There is an additional passageway by shops that leads on the east side of the station mezzanine halfway south back to 48 Street where a few High Turnstiles provide closer access to entrances to the main concourse into Rockefeller Center and the Simon and Schuster Building (1230 6 Av) as well as a staircase that goes up to become an entrance in its storefront. 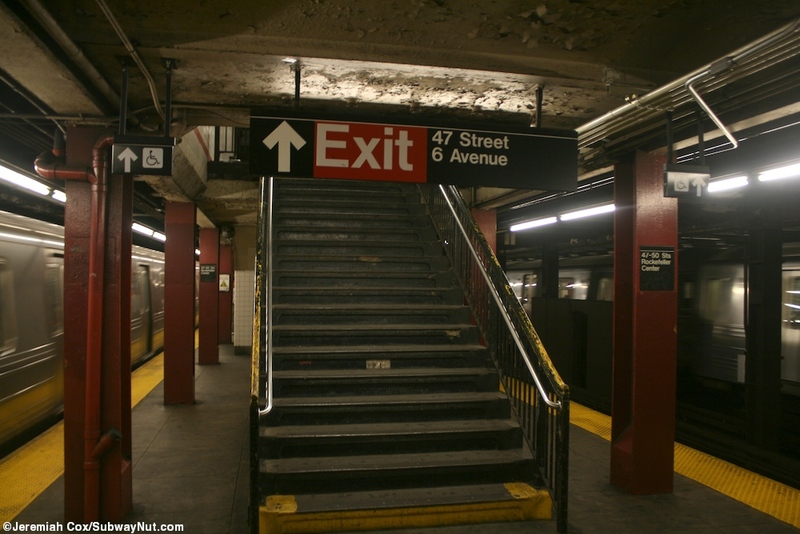 Other access from 49 Street include the main plaza of Rockefeller Center going over to 5 Avenue, an entrance inside the storefront at the NE corner in the GE Building, the elevator to provide ADA access at the NW corner next to a unique staircase in front of the fountain of 1251 6 Avenue. 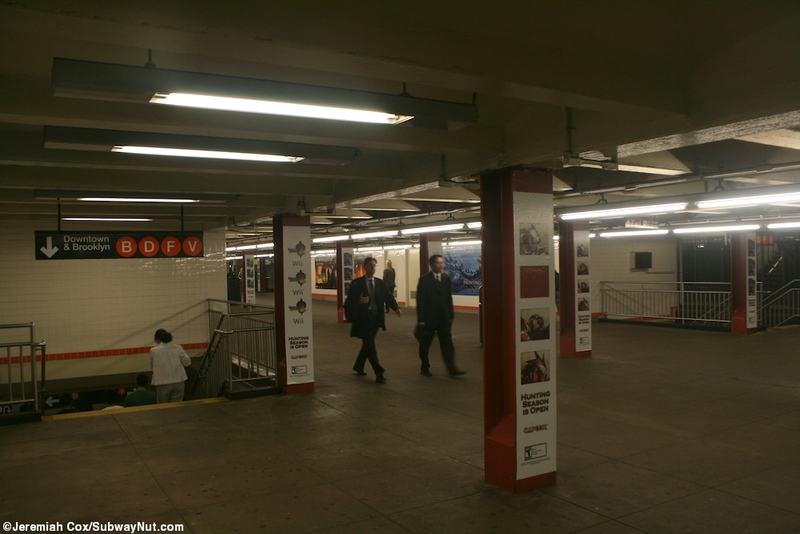 Continuing underground with lots of shops since where in a grey area between the subway and the concourse of Rockefeller Center (but all the entrances say subway on them) there is another identical unusual staircase at the SW corner of 50 Street and 6 Avenue inside the plaza of 1251 6 Avenue. One is set inside the Radio City Music Hall Building next to the main entrance to the venue (at the NE corner, passings doors into 1270 6 Avenue before going down to the concourse), and at the NW corner there is an unusual looking streetstair in front of the plaza outside the Time Life Building.